What is Food-Grade Stainless Steel? When considering products that hold food, whether it is in the fridge or the cupboard, it is important to determine which materials are used to create the product. For some, the go-to material is plastic. However, plastics are known to contain dangerous chemicals such as lead, BPA, and phthalates that can cause dire consequences over time. When choosing products to hold food for the family, one of the best materials available is food-grade stainless steel. Although food-grade stainless steel is a popular material, many people do not know why it is better than basic plastics. Below is great information about food-grade stainless steel and how it can benefit the family! The “grade” of stainless steel refers to the quality, durability, and temperature resistance of the product. Therefore, for food-grade stainless steel, this simply means that the steel used is the ideal kind to uphold quality, durability, and temperature resistance for food-related use. There are different “numbers” that quantify what kind of steel it is exactly; these numbers typically look like “18/8” or “18/10.” These classifications refer to the amount of chromium and nickel in the product. Normal, cost-efficient materials are used include plastics. However, the plastic contains lead, BPA, or phthalates, then they are rather dangerous to families. These toxins are known for causing illnesses and diseases for both adults and children. In adults: Reports show that the chemicals in plastics are related to birthing abnormalities, impotence, heart disease, autoimmune disorders, and diabetes. In children: Some reports show that toxins in plastics have shown a correlation to diabetes, early onset puberty, heart disease, autoimmune disorders, and diabetes. Food-grade stainless steel is specifically tailored to meet all food-related needs. Simply put, any product with food-grade stainless steel can be relied upon to handle drops and refrigeration, all while keeping bacteria and toxins out of the food. It is important to note that some products promise this feature, but may not be telling the entire truth; always do research for committing to a product that promise food-grade stainless steel. What Are Some Food-grade Stainless Steel Products? Flatware: Food-grade stainless steel is most popularly in flatware, or the daily dishes used. When these products are coated in or completely made of food-grade stainless steel, it is more durable, higher quality, and much safer than other products that might be covered in plastic coatings. Cookware: With non-stick coatings being reported to contain toxins found in plastics, many are turning to using food-grade stainless steel for their products. Stainless steel can withstand the heat of a stove top or an oven, making it ideal for food preparation. 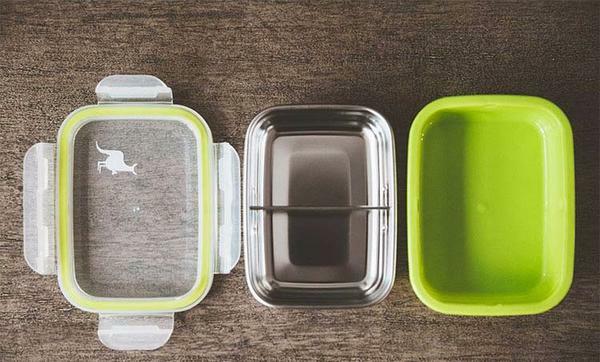 Plasticware: For containers that are intended to keep food fresh and ready for preparation, such as those made of plastic, the better option is definitely food-grade stainless steel. Since plasticware tends to get reheated and hold warm food, it is important not to use plastic. When heated, plastic can release the residue of harmful toxins in the plastic. Food-grade stainless steel is the best option for a safe and effective cooking experience! Do not scrub with a plain steel brush. These brushes can take the food-grade stainless steel coating off of products and leave consumers with an unprotected product. Instead, try washing with a soft sponge. If stained or burned food residue remains on the product, try soaking in warm water and soap. Read the label. Some are dishwasher safe while others are not. Be sure to read the label carefully and do the proper research. Hand wash, if you are uncertain. Overall, the most important thing is to do the research and find what products can most benefit your family! With the dangers surrounding plastics and the chemicals inside of them, it is a good idea to use products made of safer materials, such as food-grade stainless steel. If the material of the product in question is not clear, simple research and looking online at reviews and comments is a great way to figure out if it is a good product to use with the family. Cookware, plasticware, and flatware are most efficient and safe when they incorporate food-grade stainless steel.